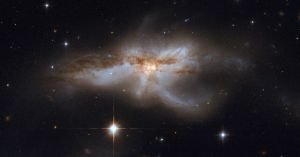 Moving in with a romantic partner is a big step, even for galaxies. According to new research, when two galaxies merge, the black holes in their hearts fuse together. That not only sounds vaguely romantic, but could also explain how certain black holes grow so large. For the study, which was published Wednesday in the journal Nature, a team of researchers used Hawaii’s W.M. Keck Observatory and the Hubble Space Telescope to probe the centers of merging galaxies. They found that the black holes at the galaxies’ hearts first drew close before merging into a single black hole. According to the researchers, the findings likely foreshadow the future of our own galaxy, the Milky Way, which astronomers predict will merge with the nearby Andromeda galaxy in a few billion years. We’ll probably be long gone, but it’s nice to think that our galactic home will finally find its soul mate.